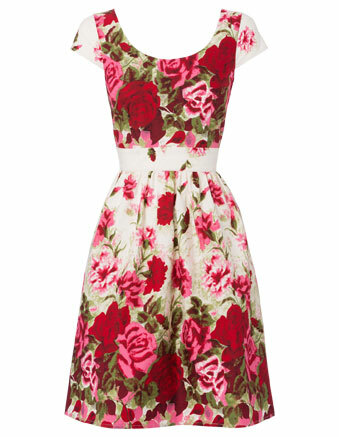 This dress from the Australian Myers Store online store, is so pretty and fresh looking with the white background and the light pink and dark pink rose print. I especially like the band at the waist made of the same fabric, only with more of the white, so that it looks like a belt. The cost is well over a hundred dollars, and I was able to make the dress for abotu $15.00 which included zipper and thread and pattern. You can find similar patterns online at Butterick, McCalls, Simplicity. 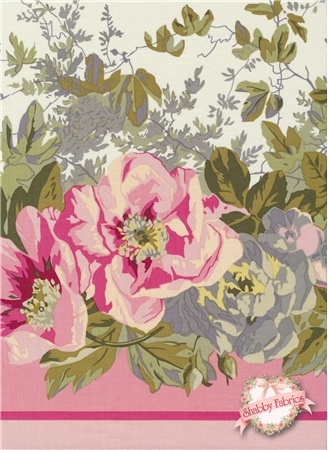 These patterns are on sale every month at Joanne fabric stores across the U.S. I have friends overseas that I can send them to, and even with postage, it ends up being cheaper than purchasing the patterns there at whole price. I must admit that in spite of the pleasure of making this dress, and the wonderful comfort of the cotton fabric, I would have liked to at least try the above dress on ! 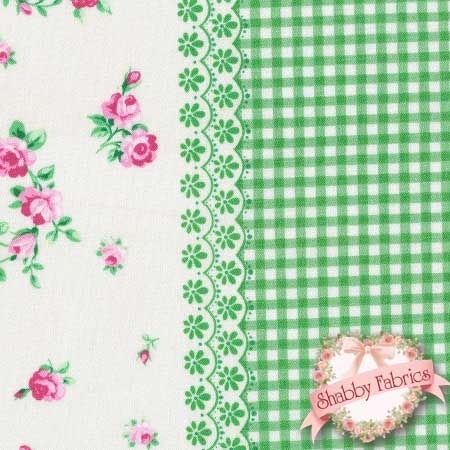 This fabric is from Shabby Fabrics and has similar colors as the ready-made dress. I may attempt to duplicate the dress in the above fabric, as I do not feel I quite did it this time. Even if you pay $10.00 a yard, a dress like this can be made for far less than the retail price. you need less than four yards of 45 inch fabric for this dress, so it can cost $30.00. However I think that is still too high, so I get my fabric at a discount using coupons at Joannes, or find the $2.50 a yard sales at Walmart. If I had nowhere to buy fabric and needed it urgently, I would buy a new, low thread count sheet at a store near me. I made my dress with less than four yards. I use the leftover pieces for headbands and hair bows or scrunchies. I've got word online from viewers that scrunchies are "out" but I am not going to pay any attention to it. Using pieces from several patterns in my pattern collection, I tried to imitate this dress, altering it for my own needs by adding length and elbow length sleeves. The fabric I used is a soft cotton and was from a fabric sale at Walmart. I was not able to make that middle waist band that is attached to the original dress, shown above. To do that, you have to cut the band from the lower part of the bodices, and leave enough on the original bodice and the cut piece, for the seam. If you wish to make this, you would do well to cut a strip off the pattern piece and lay it on the fabric, leaving enough on each edge for the five eighth inch seam. Lay the band pattern piece on a section of the fabric that is more plain, to get the same effect as the original dress. The neckline is square with rounded corners. Click for larger views and then use your magnifier to look at the pleats. The dress is easy to wear at home, since the skirt is close to the body and does not flair out much. It will not catch on anything, and as for bending and moving about, it covers well. This fabric would make a pretty dress for wearing at home, in the same style which I have sewn. You have done a great job with this dress. It's lovely. The material looks 'shabby' and you would think it was a designer fabric. I am just beginning to discover that we can experiment and make our own versions of 'shop-bought'. It is very satisfying. I love the dress you made!! 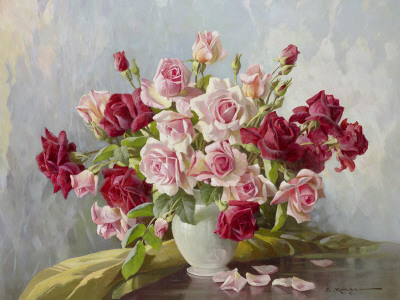 I am in love with all things floral but especially roses. I love that fabric you used how great that you got it at wal-mart. I wish I could sew like that. You are very talented. I knit. That's a very fine dress and I love the square neckline! I had great difficulty getting those pleats to match up on each side. I usually turn the pleats into gathers to make it quick and easy, but this time I wanted to make the dress look like the one in the store. I plan to get a picture of myself in it today. You have gold in your fingers!!!! That dress is great. I would love sew like you. This will be one of my goal for next year!!!! Blessings from France. Wow, you did a great job on the dress! It is so pretty and well made. I always like the dresses you show, but this one and the red one you recently featured in another post are my favorites. What an amazing talent you have! Your dress is just beautiful! PS. I still wear scrunchies too! That is a beautiful dress. You did a wonderful job. Another winner! It's so beautiful, Lady Lydia....and I can't wait to see the photo of you wearing it. Thanks for the brief instruction & inspiration. Keep on inspiring us, Lydia. Oh, this is my favorite dress that you have ever made. How fun it would be to wear for Valentine's Day. 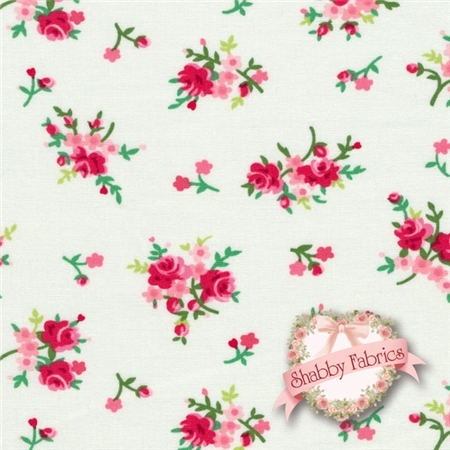 How clever and I do like the fabric you used - I am a fan of roses on fabric and have several skirts with roses. Do you prefer the square neck to the round? I loved that round neck on the Myer dress, but I also liked your square version too. I was cutting what I thought would be the rounded neckline, from a v-neck pattern. I attempted to make it more round by rounding the corners. I still prefer the original version on the dress, so the next time I try this, I hope to make a more rounded neckline. The neckline on that dress is slightly different than round, or what sewers might call a boat or cowl neckline. It is very pretty. Beautiful, beautiful, Lydia!! The neckline of this dress is so pretty and modest. Thank you for your most helpful tutorials, wisdom, and encouragement! Oh my this dress is altogether lovely and dreamy! Well done!!! Laura I would have liked to have tried on the real dress or examined it up close. I'm still trying to perfect the imitation and have another one cut out. I love your dress,although I knit and do a lot of mending I'm not much good at making clothing from scratch.You are very talented. I really like the style of this dress with the elbow length sleeves and somewhat fitted bodice. The pleats look very nice, too. I'm looking forward to your sharing about the patterns you've found and used. Is it more difficult to install a side zipper as opposed to a back one? Crocheted scrunchies are beautiful, too. I think I am inspired to try one of those.